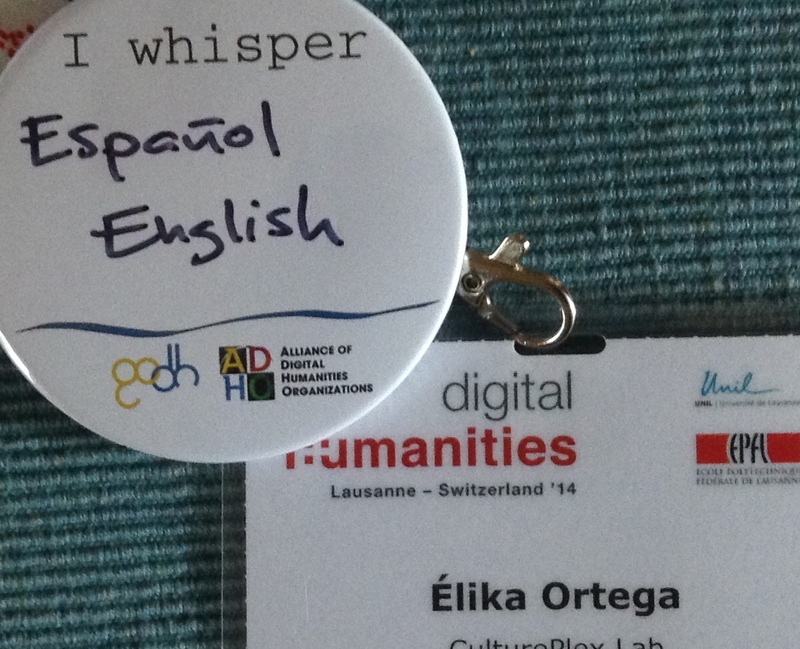 A couple of weeks ago I travelled to Lausanne Switzerland for DH2014 where I helped organize and run the GO::DH/MLMC “I whisper___” pins initiative. The idea behind was simple and informal: Those attendants who were willing to help out translating to/from any language being used at the conference could ask me or Alex Gil for a pin, write down the languages they could help out in, and then wear it for the rest of the conference ready to use their linguistic skills as needed. The whispering idea had its roots in other GO::DH members’ experience in Cuba, in which a person would literally whisper/interpret the talk being given to those who couldn’t follow it. But this is the first time (to our knowledge) that anything like this has been done at DH so it was all about experimenting and coming up with how it could be implemented, how attendants were going to respond to it, how much it was going to be put into practice, and bunch of other questions. So for about a day and half we gave away close to a hundred pins and heard what people said when they approached us. My analytic side wishes we had recorded what languages were being written down in them to get a better idea of the linguistic communities that seem to be craving this kind of exercise more. We didn’t, but I remember seeing Arabic, Catalan, Dutch, English, French, Galician, German, Greek, Hindi, Italian, Japanese, Norwegian, Polish, Portuguese, Russian, Spanish, Swedish, and surely others. First thing we learned: there are considerably more languages moving around the conference than ADHO’s official languages. Second thing we learned: we didn’t know what to do about English: take it as the starting point language or as another of the languages present in the conference. As we were giving out pins, some were unsure whether to write “English” down or not. I hope I’m not reading too much into this, but it seemed that not writing it was an indication that we were taking for granted that we can all communicate in English and that it’s all the other languages that needed bridging to/from English. I have the wonderful Glen Worthey to thank for pointing out that we should write down English too as another language of the conference. That way English speakers could ask for translation during presentations in another language, even when as we know there weren’t many of them, it was a possibility. That also meant that, for instance, a French speaker could come to a Spanish language presentation and someone could help interpreting between these two languages without necessarily using English as a meeting point, even though it might be so for many. Some participants acknowledged that even though they could translate, for example, between Dutch and English, it wouldn’t be needed. Perhaps, it really wasn’t, still, we encouraged them to take a pin and make it patent, just in case.So when anybody asked “should I write English as well?” we said yes. The initiative was warmly welcomed and turned out to be quite loud for a whisper. On Twitter and in person we kept hearing what a great idea it was, and how excited people were about putting on the pins. On the second day of the conference, Aurélien Berra sent out an “emergency request” for whisperers when much of the audience left the room right before the beginning of a talk in French. Similarly, Sarah Potvin asked us to whisper in the bilingual session she was chairing on Thursday. It was precisely at this session where Nuria Rodríguez Ortega was giving a short paper in Spanish that the potential of the initiative came into view, not just translation wise, but also as a community exercise. Initially, we imagined we would actually be able to whisper, but time was scarce, the audience was big, and the room was large, so actual whispering wasn’t going to do it. We asked everyone how they’d like to do it and Lisa Spiro suggested we whispered through live-tweeting. So we live-tweeted in English as much and as clearly as we could from Nuria’s talk (apologies for the most typos I’ve ever done in 10 minutes). Still with the feeling that there should have been a simpler way, after the session ended, someone suggested using a Google Doc in the future so we didn’t have the 140 character constraint and so that it was easier for the attendants to follow just the talk instead of filtering out from among all the other conference tweets. By the final day of the conference, calls for whisperers were coming from different sessions. Third thing we learned: people are ready for these initiatives, they’re willing to take part in them, they want to pitch in and deal with the messiness they entail, and there are lots of good ideas we hadn’t even imagined that we’re looking forward to incorporate. Throughout the days of the conference, it was very exciting to see that it was, indeed a lot of people who were wearing their pins with two, three, four and yes, even five languages written down in them! Yes, at coffee breaks and sessions we were all mostly communicating in English, but––maybe this was the real whisper, the one we all needed to hear––in each pin there was a visible, tangible presence of all the other languages, a reminder that there is always a language (or many) that we need help in. 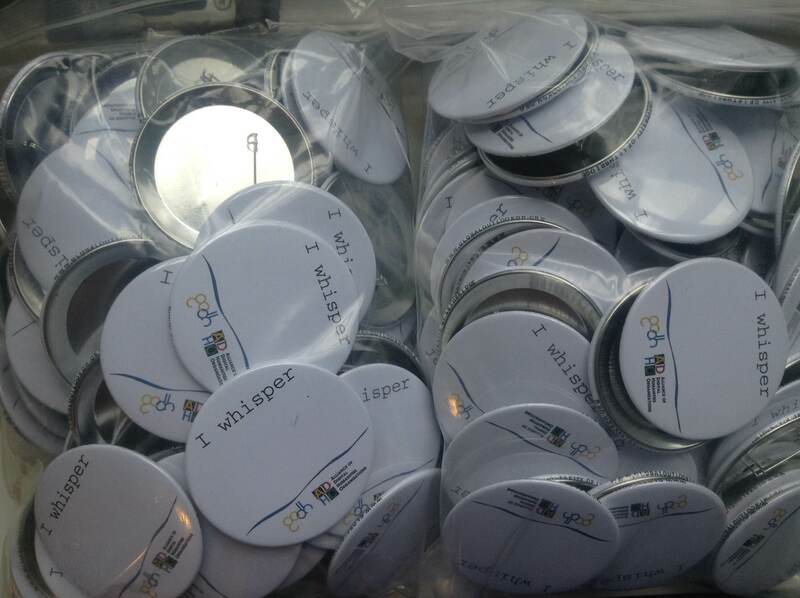 Fourth thing we learned: If nothing else, the “I whisper___” pins helped us realize (really become aware) just how multilingual DH really is, and wonder how much more it can become. Even though I’m biased, overall, my impression is that the initiative was successful. That said, it also raised a lot of questions and it wasn’t put into practice as much as it could have been. By the end of the conference, most dhwhisperers didn’t do any whispering, partly perhaps because we were all just trying it out, seeing what would happen, taking part and observing at the same time. However, I wonder how many of us presented in English when we could’ve presented in any of ADHO’s official languages for reasons like those mentioned by Martin Grandjean or others. I wonder too how many of us would consider switching to another language now that we know there is someone to help translate for others, if we knew our language choice would not interfere with the audience’s interest in our work, or if the hype of being subject to whispering increased our work’s visibility. Is this something that can impact the submission and reviewing process in the future? All the unanswered questions, I believe, highlight the significance of the initiative as well as the aspects we have to work on further. Fifth thing we learned: if an experimental initiative that was in the making for only two weeks had such a positive impact, we can only imagine it would really flourish in the future if we sustain it and improve it. Needless to say there is still a lot to do: better coordination with program committees, session chairs, presenters, and audiences would surely help getting a better grasp of what languages will have a stronger presence, what kind of translation (whispering, live-tweeting, Google Doc) might work, when, and where. Still, even though a part of me wants to make this a more organized and structured initiative so that it works better in the future––if we’re lucky enough to continue it––I hope to keep much of its spontaneity so that it is still an invitation to play, so that it seems fun (it was! ), so that it brings people together, and so that many more ideas pop up because there is no script, this is after all a really long conversation. Acknowledgements: The whole GO::DH mailing list and Executive Committee and especially Dan O’Donnell for providing the funding for the pins. Everyone who picked up a pin, wore it, tweeted about the initiative, translated, requested translation, etc. Elizabeth Burr and everyone at ADHO’s Multilingualism/Multiculturalism Committee for endorsing the initiative and spreading the word about it. Neil Fraistat, ADHO’s chair until then, for supporting the initiative from the beginning and giving us a kind shout out during his opening address. The local organizers, and the program committee, particularly Kevin Baumer and Melissa Terras, for facilitating our presence around the registration table. And a very special thank you to Bethany Nowviskie for generously mentioning us in her enlightening keynote paper. Habiendo dicho eso, pues sí, seguimos dándole vueltas al inglés sobre todo, pero por ejemplo varios tuiteamos en español las sesiones en inglés y otros en francés, pero no lo hicimos en el contexto de whispering y yo creo que sí lo fue, de alguna forma. Poco a poco a ver qué más se va haciendo. Bueno sólo para decir que yo sí tuitié en español de lo que escuché en inglés… no mucho ni sistemáticamente, pero sí lo hice, sobre todo de cosas que pensé interesarían a quienes me siguen que sé son hispanohablantes. Ajá, a eso me refería justamente, que sí hubieron otras formas y otros idiomas a los que se tradujo–pero fueron todavía más espontáneas y menos organizadas… E insisto, poco a poco. I was very glad to read about this initiative and hope this will continue at future DH conferences. I believe you are correct that there hasn’t been a similar initiative at any previous DH conferences. At least the only other instance of translation being provided that I’m aware of was at the poster/demo session for DH2007 where one of the student volunteers provided some Russian to English and English to Russian translation as needed. I believe at least one previous CFP encouraged presenters to provide handouts in languages other than the one they were presenting in as a way to reach additional conference attendees. I do wish you had kept statistics as it would have been interesting to know exactly which languages people were willing to translate and it would have been helpful for the Chair of the Multilingualism/Multiculturalism Committee to have an idea of which languages people were willing to translate. I know that there are DH reviewers willing to read a number of languages in addition to those listed in the CFPs and that attempts were made to make sure that all languages reviewers were willing to read were listed in ConfTool in the field that used to be called the “subject expertise” field but is currently called the “user comments” field. It is important to remember that even if a language isn’t listed in the CFP there may be submissions that contain examples or quotations in that language. For example, someone may submit an English language abstract that deals with text analysis of Polish and Hungarian texts or a Spanish language abstract that deals with mapping Portuguese language texts. Consequently there may be cases where it is to the Program Committee Chair’s benefit to have a complete listing of all the languages each reviewer is willing to read so she or he can make sure at least one reviewer familiar with each of the languages contained in an abstract is assigned to review that abstract. I would strongly encourage anyone currently reviewing for the DH conference or planning to volunteer to review for future conferences to make sure you’ve entered a note regarding the languages you are willing to read in the “User Comments” field in ConfTool. Also please make sure you tick the “Other” option in the list of languages that appears below the “User Comments” box on the “Edit User Account Details” page if you are including languages other than the languages listed in the most recent CFP. Thank you for your comment Sara! Yes, you’re 100% right. This is something that has to be addressed from every layer (calls for papers, presenters, reviewers, etc.). Hopefully, as we learn more and try initiatives like this and others out, little by little we’ll find a way to coordinate all those efforts.